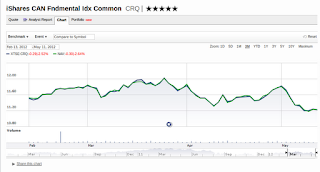 For the last few years, the iShares Canadian Fundamental Index Fund (TSX symbol: CRQ) has been my core Canadian equity holding. It is also the ETF used in the portfolio contest at the bottom of this blog, which pits the Fundamental indexing approach against the traditional cap-weighted index approach. Just as as I replaced some time ago the cap-weighted fund XIU with a lower cost equivalent ETF HXT, now it is time to replace CRQ with a new lower fee ETF. The new CRQ-equivalent was launched with too-little (since I missed it at the time) fanfare in January (press release here) by the Canadian arm of Invesco PowerShares, which offers a number of similar RAFI funds in the USA, such as PRF, PRFZ, PDN, PXH and PXF. 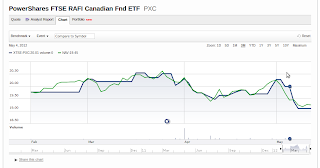 The new Canadian equity ETF is the PowerShares FTSE RAFI Canadian Fundamental Index ETF (TSX: PXC). PXC's big attraction is an MER of only 0.45% vs 0.71% for CRQ. There will be a little extra cost for PXC's trading and annual rebalancing that will only be known in a year but it should in the area of CRQ's 0.6% since it follows the identical index and trading rules as CRQ. That 0.2% lower fee will be money in my pocket - $20 extra for every $10,000 invested each and every year, which will compound and add up over the long term. As I started to look more closely at PXC to assess its potential for my portfolio, it became apparent that I am not the only one who has been in the dark. Trading volumes are minuscule. Some days there have been no trades at all and on many days there have been less than a hundred shares traded. 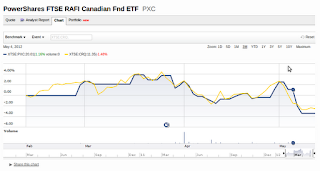 That has caused some misleading pricing reporting for PXC on mainstream sites like Google Finance, TMX Money and Morningstar, which all use Toronto Stock Exchange public data. The public data makes it look as though PXC is doing a very poor job tracking its index and its Net Asset Value (NAV, the value of the underlying portfolio holdings within PXC). 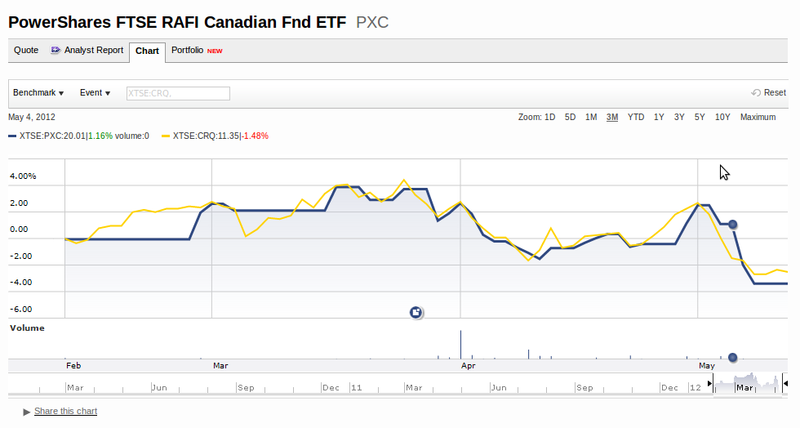 Look at this Morningstar chart of PXC's closing price vs that of CRQ. The lines don't overlap at all though they should track almost perfectly given that the two ETFs track exactly the same index with its holdings and weightings. 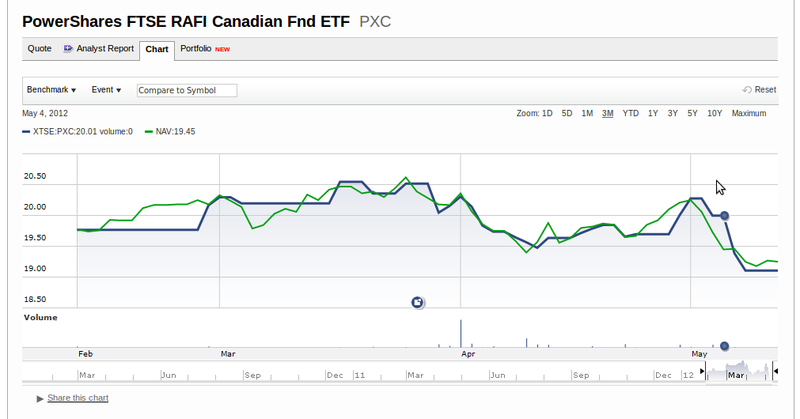 PXC also seems to be far off having its market price reflect its NAV per this Morningstar chart. Meanwhile CRQ has been tracking its NAV very closely. Making the situation even more puzzling is data published on the Invesco website in this table. 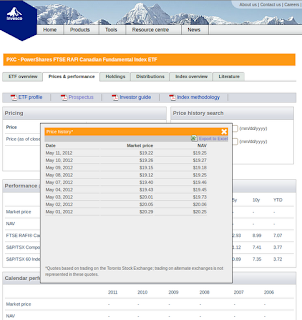 If we look closely at the data for May 4th, a day in which there is a large spread between PXC's price and NAV, we see that Google, Morningstar and TMX all report a closing price of $20.01. Invesco's table reports the price as $19.43, purportedly based on TSE data. The NAV was $19.45. It took a phone call to Invesco to clear up the discrepancy. According to Invesco, the reason is that most of the trading for PXC has actually been taking place on alternative exchanges like Alpha and the price there, which Invesco has been reporting, much more closely matches the NAV since it is much more current. The important thing for the investor is that the bid-ask live quote for PXC at any point will be close to NAV. In that regard, I have minimal fear of paying a big premium over NAV for PXC. Unfortunately there is no way of actually verifying that since in Canada, unlike the USA where it is apparently required by regulation, the intra-day live NAV value is not available on any website. Yesterday, when I spoke to Invesco rep Chris, he checked and relayed to me that while the NAV at that moment was $19.00 the market bid price was $19.00 (what the bidder was offering to buy shares at) and the ask was $19.03. That's a very reasonable spread premium of only 0.16% for an investor placing a market order to buy. 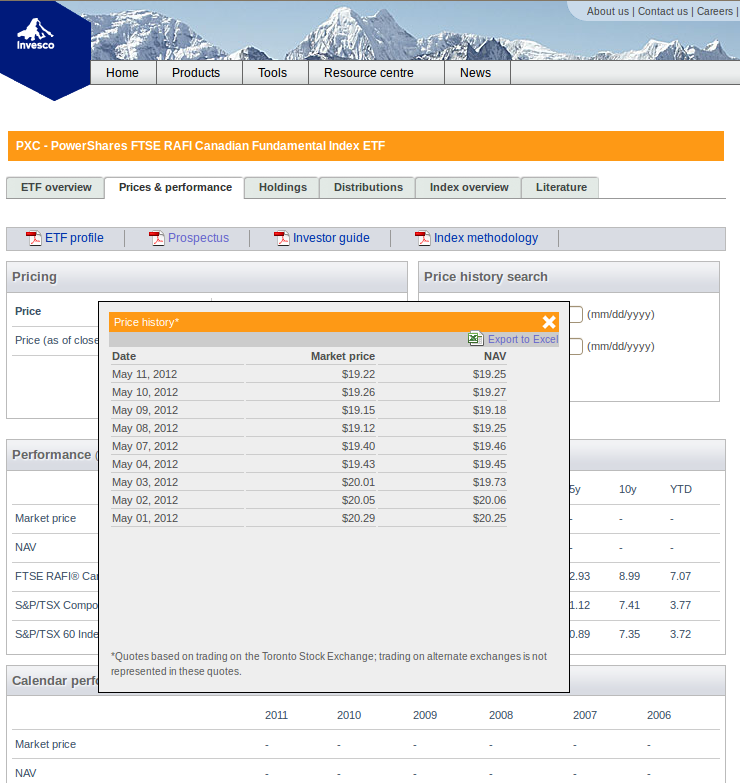 So the ETF pricing mechanism that keeps ETF prices and NAVs very close is not failing for PXC. Invesco says that there are six market makers for PXC, with the primary one being National Bank. In short, PXC checks out ok. The 0.2% lower annual expense is worth the switch. 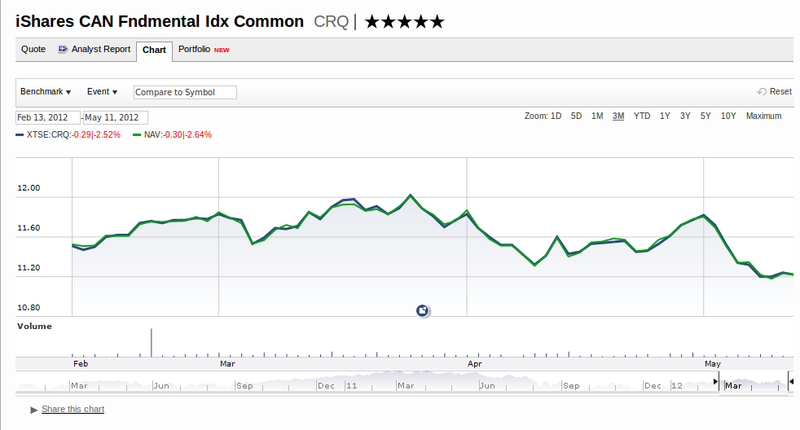 Claymore or new owner BlackRock/iShares should have pre-emptively lowered CRQ's too-high fees. I am replacing CRQ with PXC in my test portfolio as well as my own holdings.